To celebrate my birthday last weekend, I had some friends over to play games and relax. We played fun minute-to-win it style games (basically absurd and unusual games with household objects). Unfortunately, I don't have any pictures from the party... For one of the games, we hung bananas from our waist and pelvic-thrusted oranges onto paper plates using the banana. It was as strange as it sounds... The bananas weren't really great for peeling and eating, since they got bruised along the way. 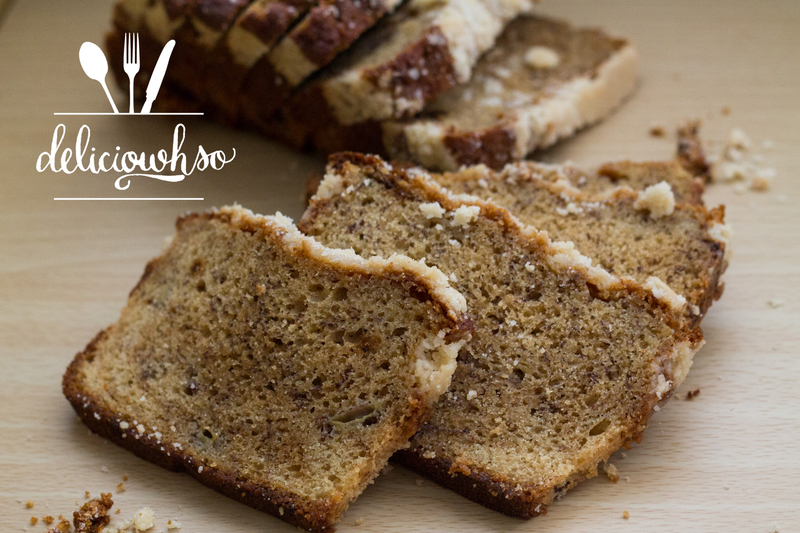 Luckily, the peels didn't break, so they were perfect for smashing up into banana bread! My mom always used to make banana bread for my school teachers around the end of the school year when I was growing up. Thanks to the party, I had some bananas lying around, so what better use than banana bread! 1. Preheat oven to 325 degrees F. Prepare 2 large loaf pans by spraying them well with baking spray. 2. In a large bowl, cream butter and sugar together until smooth and creamy. 3. Once aerated, add eggs gradually and mix until smooth. 4. Add dry ingredients, and then mix very slowly until incorporated. 5. Peel bananas, and smash with your hands into the mix. 6. After the bananas are dispersed throughout the batter, pour the mix into the prepared loaf pans. 7. In a bowl, place sugar and flour together. 8. Cut butter into small pieces, and use your hands to make a crumble. 9. Once the mixture becomes sandy, sprinkle a generous layer over each of the loaves. 10. Place the loaf pans onto a baking sheet to catch any drips. 11. Bake for about 1.5 hours, until the centers are fully baked. Test this using a toothpick or knife and poking a hole into the bread. It should come out clean. 12. Allow the bread to cool completely before removing from the pan. This is a simple, delicious recipe. It's not too sweet, and the crumble adds a nice texture. You can also add nuts, chocolate chips, or whatever else you desire to the batter for even more variety. 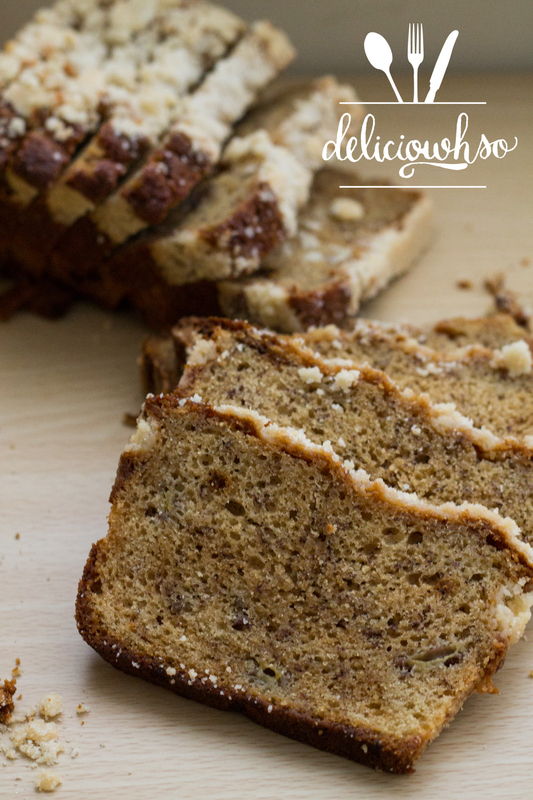 I like to keep my banana bread classic, with a scoop of vanilla ice cream and a drizzle of honey on a hot day! Looks awesome! Will try soon! Could you post a recipe for lemon pound cake?